Sigma Kappa (ΣΚ, also known as SK) is a sorority founded in 1874 at Colby College in Waterville, Maine. Sigma Kappa was founded by five women: Mary Caffrey Low Carver, Elizabeth Gorham Hoag, Ida Mabel Fuller Pierce, Frances Elliott Mann Hall and Louise Helen Coburn. Since its founding in 1874, the sorority has initiated more than 165,000 members worldwide and has more than 120 collegiate chapters in 36 states and over 120 alumnae chapters in 40 states. The sorority is one of 26 members of the National Panhellenic Conference (NPC) of national women's fraternities. The sorority's official philanthropies are gerontology (with a focus on Alzheimer's disease research), Inherit the Earth, and the Maine Sea Coast Mission. In 2015, Sigma Kappa alumna, Donna King, Epsilon Rho, was installed as the 2015–2017 Chairman of the NPC. Colby College in Waterville, Maine, was the first college in New England to admit women on an equal basis with men; in 1871, Mary Caffrey Low Carver became the first female student at Colby. For two years, she was the only woman at the school. But in 1873, four more young women from Maine, Elizabeth Gorham Hoag, Ida Mabel Fuller Pierce, Frances Elliott Mann Hall and Louise Helen Coburn were admitted to Colby. Being the only women in the college, the five of them found themselves together frequently. In 1873–74, the five young women decided to form a literary and social society. They were instructed by the college administration that they would need to present a constitution and bylaws with a petition requesting permission to form Sigma Kappa Sorority. They began work during that year and on November 9, 1874, the five received a letter from the faculty approving their petition. They sought for and received permission to form a sorority with the intent for the organization to become national. Since that time, Sigma Kappa annually celebrates November 9 as its Founders' Day. Mary Caffrey Low was the first woman to appear on the rolls of Sigma Kappa and the first to preside over an initiation. The first Sigma Kappa emblem was designed by Elizabeth Gorham Hoag, who died shortly thereafter of tuberculosis. A large portion of the initiation ceremony was written by Louise Helen Coburn. Much of the original initiation music was written by Hoag's cousin, Emily Peace Meader, who was inducted shortly before Hoag's death in 1875. Frances Mann Hall was the first Sigma Kappa to get married, to a fellow Colby student. In the first constitution, chapter membership was limited to 25. The original group was known as Alpha chapter and as the sorority grew, Beta chapter and Gamma chapter were also established at Colby College. Early records indicate that the groups met together; but in 1893, the Sigma Kappa members decided that intramural expansion was not desirable. They voted to fill Alpha chapter to the limit of 25 and to initiate no more into Beta and Gamma chapters. Eventually, the second and third chapters would vanish from Colby campus. Finally, Sigma Kappas realized if the organization was going to continue to grow, it had to expand beyond the walls of Colby College. The Delta Chapter of Boston University is now the oldest existing chapter. The Eta Chapter of Illinois Wesleyan University is the longest continuously running chapter. In 1984, Colby College banned fraternities and sororities, ensuring that Sigma Kappa's Alpha, Beta, and Gamma chapters will probably never be resurrected. In 2005, the Sigma Kappa Mu Chapter House obtained City of Seattle Landmark status, becoming the only sorority or fraternity in Seattle to achieve Historic Landmark status both at the City of Seattle and on the National Historic Register. In June 1892, the violet was adopted as the official flower. In 2008, the official flower became the Wild Purple Violet to distinguish it from other varieties of violets. Sigma Kappa's colors are lavender and maroon. The pearl is the official jewel of Sigma Kappa. The dove was accepted as an official symbol of Sigma Kappa at the 1984 convention and the heart was adopted at the 1988 convention. 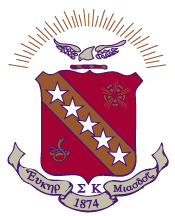 The Sigma Kappa coat-of-arms includes the symbols of the sorority – the dove, the violet, the Greek letters, and maroon and lavender. Adopted in 1911, the coat-of-arms consists of a maroon shield with a diagonal bar of gold, bearing five lavender stars; the lower portion a coiled serpent. Above is a wreath of alternate maroon and gold, surmounted by a dove in silver, with outspread wings, all beneath an arch of gold rays. Below is a scroll of silver, bearing in black the open motto and the date 1874. The significance of the coat-of-arms is revealed only during the ceremony of Initiation. The current membership badge is a one-inch jeweled triangle with Greek letters Σ and Κ. The triangle badge was chosen in 1894, and later, jeweled badges were approved at the 1915 convention when the pearl was adopted as the national jewel. Unjeweled badges have a scroll edge. Badges are either made of silver, white gold or yellow gold. The new members pin is only worn during the new member period. It is a serpent in the form of the Greek "Σ" (Sigma) intertwined on a Greek "Κ" (Kappa). This design was adopted as the new member pin in 1920. There are also alumni pins, 25-year pins, and 50-year pins, and the "Pearl Court Pin" which is given to recipients of the Ernestine Duncan Collins Pearl Court Award, which is a national award given by the organization. Sigma Kappa is associated with the Sigma Kappa Foundation, which was established in 1962, and incorporated as a 501(c)(3) nonprofit organization in 1989. Since 1918, Sigma Kappa has worked with the Maine Sea Coast Mission to aid communities and ecologies of coastal Maine. Since 1954, the organization has also supported Alzheimer's Disease research and other issues related to gerontology. In 1945 gerontology was adopted as another main philanthropy of Sigma Kappa. Members help elderly people in their communities. The Organization's "Inherit the Earth" program involves working to protect the environment through a variety of different projects. The Walk to End Alzheimer's and Ultra Violet are the two biggest philanthropy events that every Sigma Kappa chapter takes part in. Every year each sorority for the Walk to End Alz, makes a team and raises money weeks prior to the walk. Then after this done the sororities participate on the day of the walk and the money goes directly to the Alzheimer's Association. The Sigma Kappa Foundation has had a long-term partnership with the Alzheimer's Association. According to sigmakappa.org, "In 2015, Sigma Kappa raised over $700,000 across the country and became a 2016 Platinum National Walk Team. The Ultra Violet is another one of Sigma Kappa's philanthropy events. A lot of chapters have Galas, raffles, auctions and much more and make them customizable for their chapter to give back to its foundation. Sigma Kappa members cite their core values as friendship, loyalty, service, and personal growth. These aim to foster a sense of community and development intellectually, spiritually and socially. Collegiate and alumnae chapters have various programs to implement these ideals. Sigma Delta, former chapter at Dartmouth College. ^ a b "About Us | Sigma Kappa". sigmakappa.org. Retrieved 23 December 2016. ^ Kappa, University of Louisville chapter of Sigma. "Sigma Kappa | University of Louisville". louisville.sigmakappa.org. Retrieved 2018-02-05. Guide to Sigma kappa Records at the University of Denver Retrieved 2014-09-26.